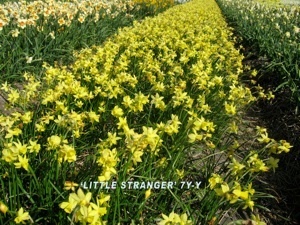 Pollen from the anther of one variety is placed on the stigma of another variety. These pollen grains grow down the pistil and fertilize seed in the ovary which is just behind the bloom at the top of the stem. These seed develop and are ready to collect in about six weeks. 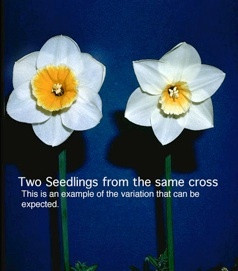 Each seed must grow into a blooming size bulb and this takes about six years. 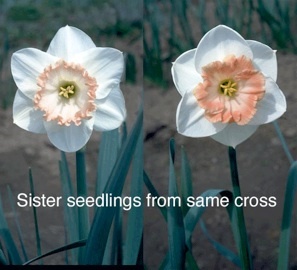 Each of the seedlings from a cross is different. 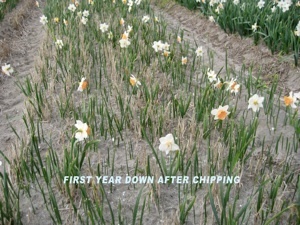 Once a seedling has been selected as an improvement it will increase each year by bulb division. 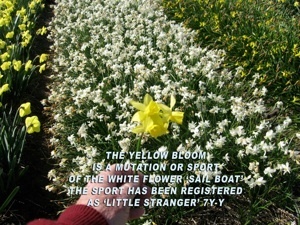 A new variety may also result as a mutation commonly called “sport” of an existing variety. 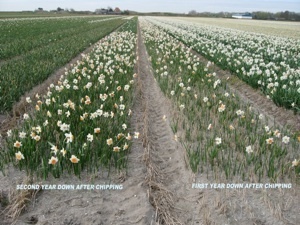 The Dutch increase the number of bulbs of a variety by “chipping”. They have a devise which cuts a bulb into eight pieces. Each piece contains a part of the base plate and the upper part of the bulb. These chips will make a full size bulb in three years.